The SEA-SEIS Song and Rap Competition for Secondary Schools ran from October to December, 2018. It was advertised on the SEA-SEIS website and through teacher networks. 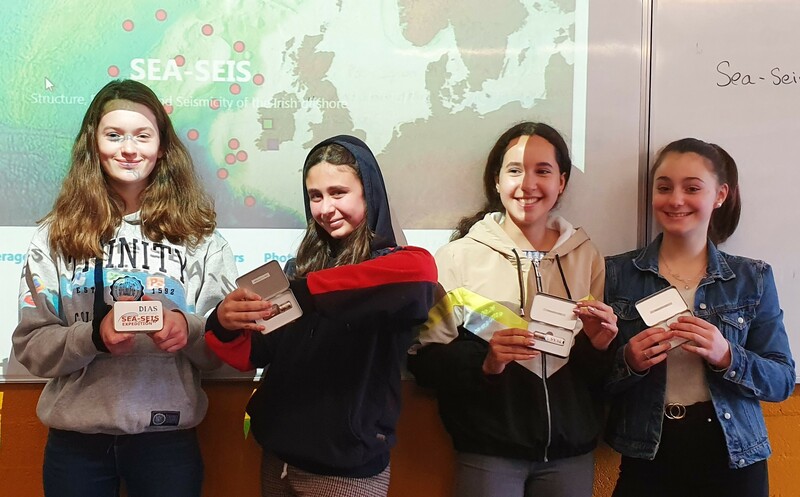 The competition received excellent entries – creative, imaginative, artistic, and with a variety of original takes on Earth science and seismology at sea. The competition for the Grand Prize was fierce and, in the end, the top prize was shared by two entries. Runners-up have been distinguished by the Jury with Special Mentions. 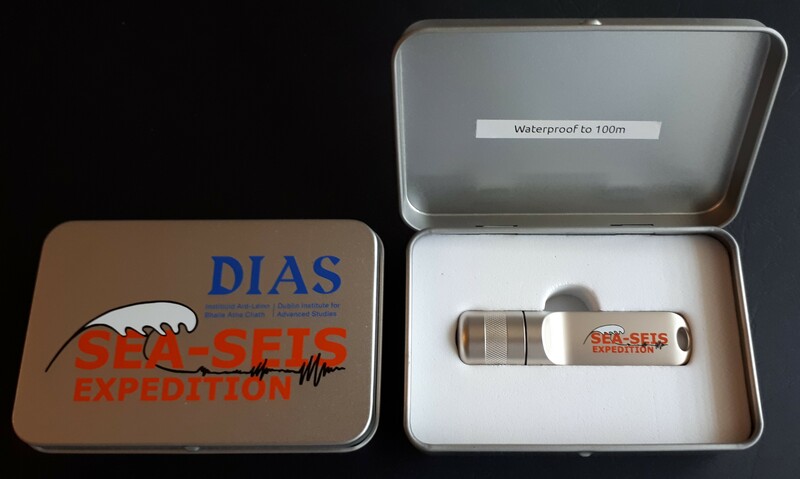 The Grand Prize winning groups receive the original SEA-SEIS flash drives (16GB, waterproof to 100 m depth), one for each student in the group and one for their teacher. 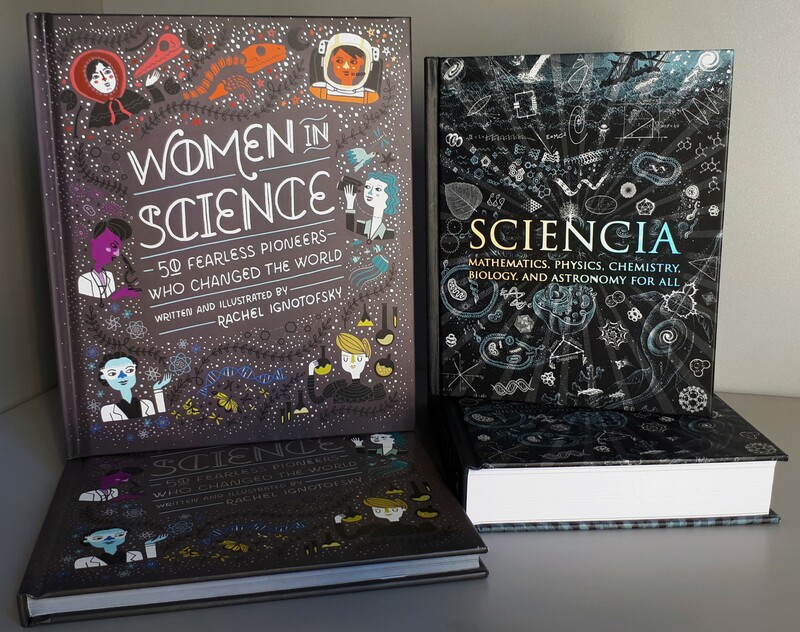 Classes contributing entries that received Prizes and Special Mentions receive inspirational science books, specially selected by the SEA-SEIS Team. Recipients of a Special Mention also receive fun SEA-SEIS pens. Grand Prize and Special Mention for Best SEA-SEIS song: “The Earth is so alive inside it’s always movin’.” Lyrics by James Moore, class 2.1, music by Luke Shiels and Killian Taylor, 6yr, science teacher: John Bourke. Presentation College Bray, Co. Wicklow. Grand Prize and Special Mention for Best Performance: “When you want to measure the shaking…” By Caren Lara Chilewitz, Albane Charmeil, Astrid Jaubert, Sabrina O’Connell, Kacey Philippe, 2nd year Science and Technology class (4eme, science teacher: Céline Tirel), Lycée Français d’Irlande, Dublin. Special Prize, Best Science Song and Special Mention, Best Adapted Lyrics: “The Pressure Builds Up.” By Class 1.11 (teacher: Siobhan Alley), Presentation Secondary School, Clonmel, Co. Tipperary. Special Mention, Best Educational Song: “Plate Tectonics.” By Jessica Walsh and Alannah Whelan, 1st year (Geography teacher: Jessica Lynch), Kingswood Community College, Dublin. Special Mention, Best Video and Best Production: “This earthquake is gonna spill my milkshake.” By Carlos Argudin, Lohann Bonnec, Marc Crouzat, Jesus Losa Maso, Alix Seara, 2nd year Science and Technology class (4eme, science teacher: Céline Tirel), Lycée Français d’Irlande, Dublin. Special Mention, Most Atmospheric Rap: “On This Planet.” By Class 1.11 (teacher: Siobhan Alley), Presentation Secondary School, Clonmel, Co. Tipperary. Special Mention, Most Motivational Rap: “Seismology.” By Class 1.11 (teacher: Siobhan Alley), Presentation Secondary School, Clonmel, Co. Tipperary. Special Mention, Best Parody Song and Special Mention, Best Rap Solo: “Bang Bang, Parody Seismology Version.” Margaux Anderson, Roan Batard, Angelina Cosgrove, Ethan McQuaid, 2nd year Science and Technology class (4eme, science teacher: Céline Tirel), Lycée Français d’Irlande, Dublin. Special Mention, Best Rhymes: “Fresh Prince of Bel Ocean.” By Class 1.17 (teacher: Siobhan Alley), Presentation Secondary School, Clonmel, Co. Tipperary. Special Mention, Best Hip-Hop Song: “Earthquakes, they make the Earth shake, they make the plates break…” By Jacques Ferrandez, Sarah Guillemet, Jesse Loigerot, Iseult Purser, 2nd year Science and Technology class (4eme, science teacher: Céline Tirel), Lycée Français d’Irlande, Dublin. Special Mention, Funniest Rap: “Oh no, the ground is shaking…” By Marilou Gerbelot Barillon, Mia Blondelle, Benoit Clarke, Victor Milan, 2nd year Science and Technology class (4eme, science teacher: Céline Tirel), Lycée Français d’Irlande, Dublin. Special Mention, Best Mix: “Geography Crew.” By Class 1.17 (teacher: Siobhan Alley), Presentation Secondary School, Clonmel, Co. Tipperary. Special Mention, Back-to-the-Basics Rap: “An earthquake is a set of vibrations, brief and brutal.” By Selyan Goulard, Raphael Lemarié, Emy Leroux, Leo Loisel, 2nd year Science and Technology class (4eme, science teacher: Céline Tirel), Lycée Français d’Irlande, Dublin. Hear some of the songs in our SEA-SEIS Art video.